no mas pantalones: Found Item Clothing "Gimme Head Till I'm Dead"
Just lounging around on this rainy day watching "Revenge of the Nerds" on the Esquire channel, and I'm so disappointed they blurred out the word "head" on Booger's shirt. 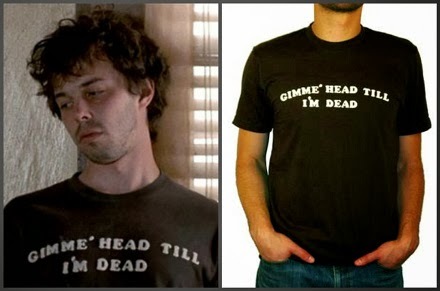 Found Item Clothing keeps it real though with their replica of the "Gimme Head Till I'm Dead" t shirt featured in the movie. I assure you, though, that the American Apparel blank this replica is printed on is way softer and fits better than the original from the 80's. Wear this classic and make Snotty proud.